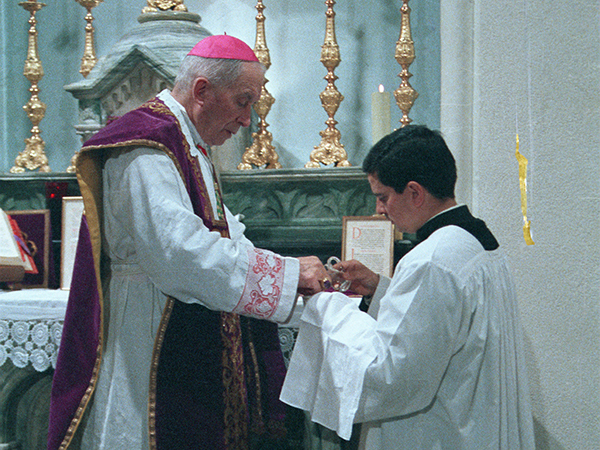 By the character of the sacrament of holy orders imprinted on his soul at the moment of ordination, the priest is made a sharer in the priesthood of Our Lord Jesus Christ. He participates, so to speak, in the grace of the hypostatic union, which unites the human nature of Jesus to the Divine Person of the Word who assumes it in the Incarnation. Consequently, like Christ, the priest is established as a mediator between God and men: he forms the bridge between God who is to be placated and men who are to be reconciled. He is a pontiff, in Latin pontifex, “bridge-builder”. This is the doctrine of St. Paul: “Every high priest”, the Apostle says, “taken from among men is ordained for men in the things that appertain to God, that he may offer up gifts and sacrifices for sins” (Heb. 5:1), starting with the sacrifice par excellence, Holy Mass. In return, the priest causes God’s mercy and graces to descend upon mankind: the Latin word for priest, sacerdos, means “sacra dans”: one who gives holy things to men. He is the minister of Christ the Priest in distributing the graces of Redemption. St. Paul declares this: “Let a man so account of us as of the ministers of Christ and the dispensers of the mysteries of God” (1 Cor. 4:1). To sum up, the priest is another Christ: Sacerdos alter Christus. The priest is also called “the man of God” (1 Tim. 6:11; 2 Tim. 3:17). By his priestly character as well as by his sacred ministry, he is distinguished from simple baptized Christians, not by a difference of degree but essentially. But the same Council, in its Constitution on the Church, also advocates a common priesthood of all the baptized; this Protestant-sounding expression in and of itself allows commentators to ignore the preceding truth and to adhere to error. Marcel Lefebvre disapproved of this duplicity. St. Thomas Aquinas, to be sure, teaches that the three sacramental characters of baptism, confirmation and holy orders are participations in the priesthood of Christ, but he is careful not to say that the baptized or confirmed Christian receives any sort of “priesthood”. The “common priesthood” is a priesthood only in a metaphorical sense, and in this sense St. Peter speaks about a “holy priesthood” or a “kingly priesthood” (1 Pet. 2:5-9) that offers spiritual sacrifices. Although it is true that, by virtue of their baptismal character, simple Christians are invited to offer themselves and join in the Mass, this still does not make them ministerial priests. Configured by his character to Christ the Priest, the priest, and he alone, has received the power to effect, at the consecration of the Mass, the transubstantiation of the bread into the Body of Christ and of the wine into the Blood of Christ. By repeating the words spoken by Christ at the Last Supper, he acts in the person of Christ the Priest as His privileged instrument. He makes really and substantially present the Body and Blood of Jesus Christ under the species—or appearances—of bread and wine. This unique power was given neither to the Virgin Mary nor to the angels. 1. Baptism, the “gateway” to the other sacraments. 2. This should be Christ the Priest and not Christ the Head! Christ is priest by His hypostatic union, He is head of His Mystical Body by the fullness of sanctifying graces that fills His soul. These are two very different graces, even though the latter requires the former, in the sense that the Consecrated One essentially must be holy in His soul, and that in order to pour out sanctifying grace into souls, the priest of Jesus Christ must have the fullness of it: “Of His fullness we have all received” (Jn. 1:10). "If the priest is called 'another Christ' and is truly such by reason of his sharing in Christ's power, should he not also become and be recognized as another Christ through imitation of Christ's deeds? 'Let it be our principal study to meditate upon the life of Jesus Christ.'" “When he spoke of the Mass, his faith shone forth. For him it was like that, the Mass was everything!" "What the Church needs, what the people long for, are priests of God: priests who expresses God by their whole being, by their whole attitude, by their whole manner of acting, by their every word."